humpingtheheater150, originally uploaded by rkbentley. When doing a total water change for our male betta, “Patches”, my 6 year old daughter thought she was helping, and decided to fill the aquarium with tap water and to ahead a put the fish in when I stepped away to take care of another matter. He seemed fine last night, but this morning he is listless, and staying at the top while slowing taking in air. Is there anything that can be done to save him?? A: There are a couple of things that could be troubling to your betta in this case. First is thermal shock. Fish, as you know, are sensitive to rapid fluctuations in water parameters with temperature being one of the most significant. To avoid shock we try to keep the temperature variable down to about 2 degrees Fahrenheit or 1 degree Celsius per 24 hours with an ideal temperature of about 78F [25.5C]. I have no idea what the temperature difference was between the old water and the new aquarium water but it would be a small miracle if your 6 year old was able to keep it even remotely close to same temperature as the old water. The best thing you can do is to bring the water into a survivable range (if it is at some extreme) and then slowly over hours or even days bring it back to the ideal. The second problem is chlorine/chloramine poisoning. Most of us have tap water that is treated with chlorine and/or chloramines to prevent pathogens from infecting us. While it’s safe for us to drink it can be deadly to our fish. It sounds like you are already treating the water in your regular routine so in this case the best thing you can do is add your regular water conditioner to the tank as soon as possible to avoid further toxicity. 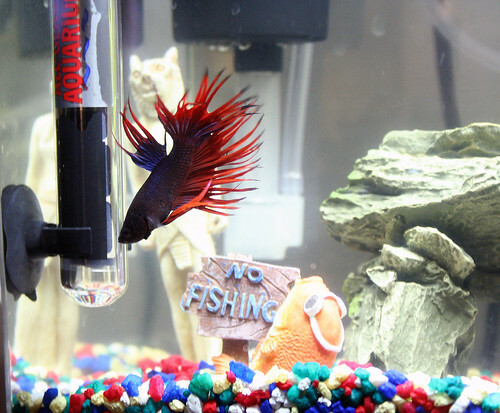 If your Betta appears to be struggling to breathe, which can sometimes happen when exposed to poisons like chlorine, ammonia, etc; you may find adding an air stone to tank can ease the burden somewhat. He will continue to use his labyrinth organ to get atmospheric oxygen but may be able to retrieve more dissolved oxygen from the water if there is an air stone to supplement. Unfortunately, this is just a tragic accident and there isn’t any quick fix to save your betta. All you can do is get the betta into livable water as soon as possible and then work to slowly bring it back to it’s ideal range. If your betta survives then the next step would be to prevent future incidents, which I bet you’re already on top of. Also, continue to monitor him daily for signs of disease. Sometimes bettas are able to survive traumatic events but will later come down with diseases as a result of a weakened immune system. All the best to you, your daughter and Patches. Help! I think I shocked my Betta, “Abbi” with water that was too warm. She is having a hard time balancing and seems to be propping herself up along side her plants. Will she recover? i did the same thing. I’ve only had my betta for a week and it was my first time changing his water. I got “Angel” accumulated with the water the same way I did him when i first put him in his new tank. And i thought letting the water sit out for awhile would bring it to room temp, which is wat i did the first time. He was so happy and now he’s like …..just kill me. Im sad. I kinda its chlorine poisoning. I dont have any of that water stuff. I just got my Betta fish named Phineas and I am wondering if it is possible to put too much water conditioner in his bowl. The measurments on my water conditioner says 5ml/3.7 L and I out in about 1.5 ml/ 1.091 liters. I am having an issue getting in the exact amount. Help? Hi, I changed my betta “Nemo” water like i usually do; I thought the water was fine normal temp but I realize the solution that i am using was crystalize and don’t think it had as much effect purifying the water; my fish went the jerking and swimming Crazy!!!!! Scared me i took it to petco she put a little solution they had in his little what i call suitcase (his little container) Test his water had a little chlorine in it not much; but I bought Betta Revive! My fish is still jerking but not as bad. MY First Pet! Really scared me there! I hope im treating him right???? I accidently got my little guy in a slight shock..but i kept talking to him and kept him moving and in 10 minutes he is doing fine..he is a strong little fish. we had four but he is the last survivor. He looks at me when i call his name which is Buddy..he knows..Very smart..he shakes his head when i do it while i talk to him too..its so cute..that’s how i know he is doing fine..he is a great little guy. Ok – I didn’t know about treating the water. My beta is at work and I won’t be back until tomorrow morning. Will he survive the CHLORINE? This whole thing has stressed me out…. Help! I was ching the water in my fish bowl and forgot to measureply the temperature ofor the new water before I put my betta in. He freaked out, rapidly swaM around the bowl and lodged himself on top of his plants so most of his body was out of the water then went limp. I quickly removed him from the bowl to a smaller one with similar temperature but cooler and gradually cooled down the water. He is still brearing and swimming but it appears one fin moves a lot less than the other, he swims for a few seconds up to get air then just rest on the bottom, propelling himself with one fin. Usually when my hand comes near his bowl like when I feed him, he darts away from my hand but now he barely moves will he survive? Has anyone experienced this?